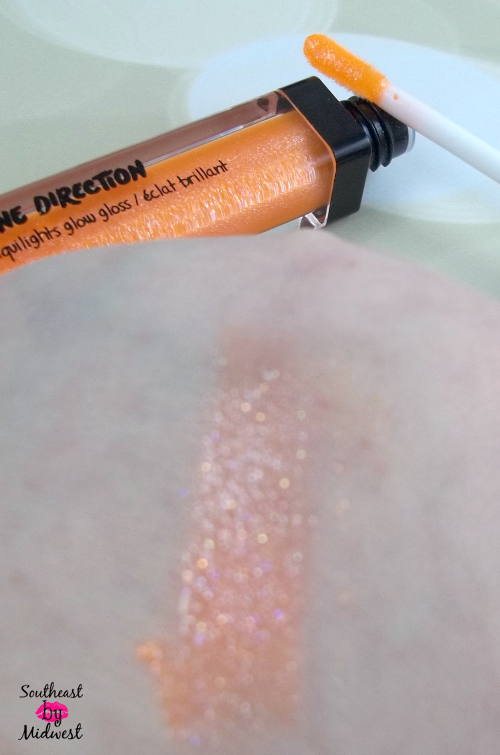 I posted an overview of the new Makeup by One Direction line recently, read that here, and right after posting that I received my set to review! As you can see I received the “Take Me Home” set to review. 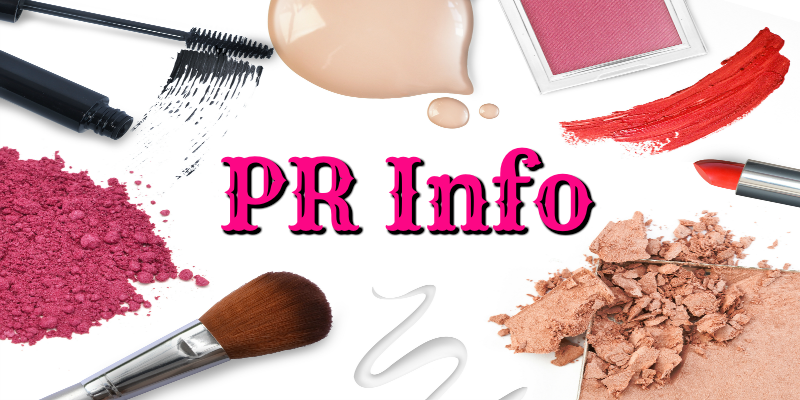 Before we get into a review of the product how about a makeup tutorial featuring them? Click to watch my Makeup by One Direction Makeup Tutorial. The products came in a super nice tin that opens fairly easily but closes rather securely. The inside of the cover tells you about the set and the other side has all the products nice and secure. I think that having the collection in a tin is great because I can totally reuse the tin for other makeup items or even pens and pencils. Due to the fact that the set comes with a set of stencils I really like that the outer part is a slipcover instead of permanent art. This way I can use some craft paints and make some designs on my tin without ruining the design. Speaking of the stencils, that’s where we’ll start with our review. As you can see they come in this super cute decorated little envelope type package. You just flip it over, slide the top tab out of the bottom and there are your stencils ready to go. 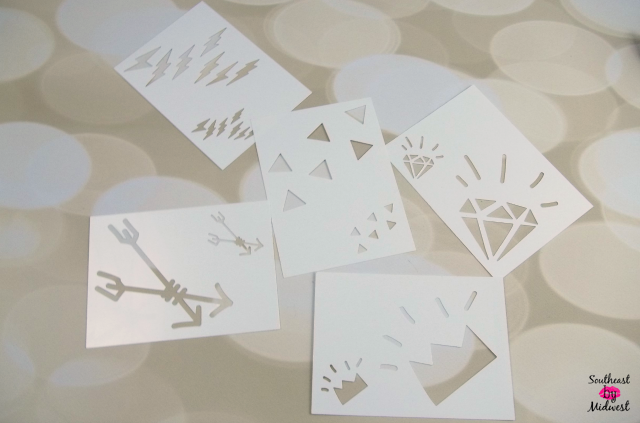 These are the different stencils that are included in the set. As you can see there are several different designs that I think are actually pretty cool. I’ve actually seen a post where someone used them on their face so they are also multifunctional. 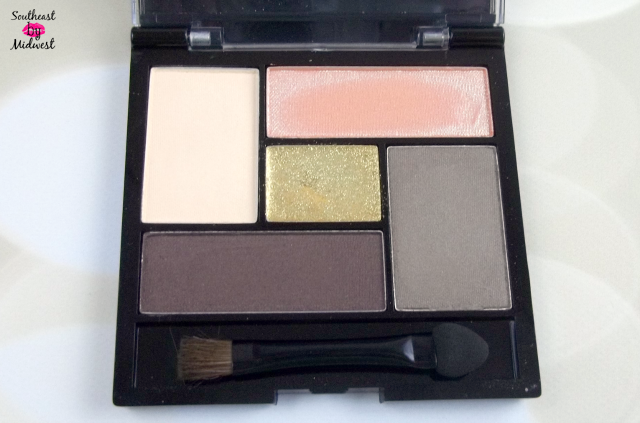 Next we’re going to move onto the eye shadow palette. As you can see the outer packaging of the palette keeps with the brick theme that the tin has. 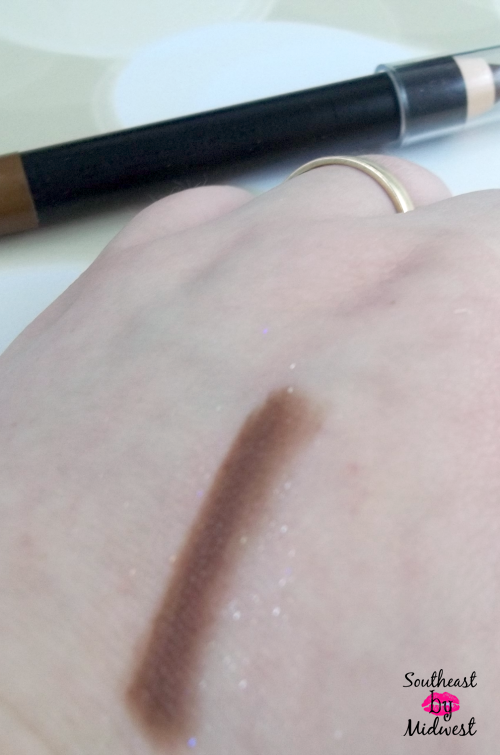 I really like how it has the little spot in the middle where you can see a peek at the gorgeous eye shadow colors. Which are just gorgeous in the pan. Starting at the upper left and working clockwise, the pale shade is Back for You and is super soft and velvety, next to it the peach shade Change My Mind is just gorgeous and just as soft as the previous shade. The two browns C’mon C’mon (the lighter shade) and Little Things are both just as velvety as the other two and I had no problem with these being patchy at all. The last shade is the gold glitter, Take Me Home, which I did find to be a bit grainy. Here are Back for You, Change My Mind, and Take Me Home. As you can see all three of these have great color pigmentation, even the glitter shadow which felt grainy on the skin had great pigmentation. Lastly here are C’mon C’mon and Little Things. 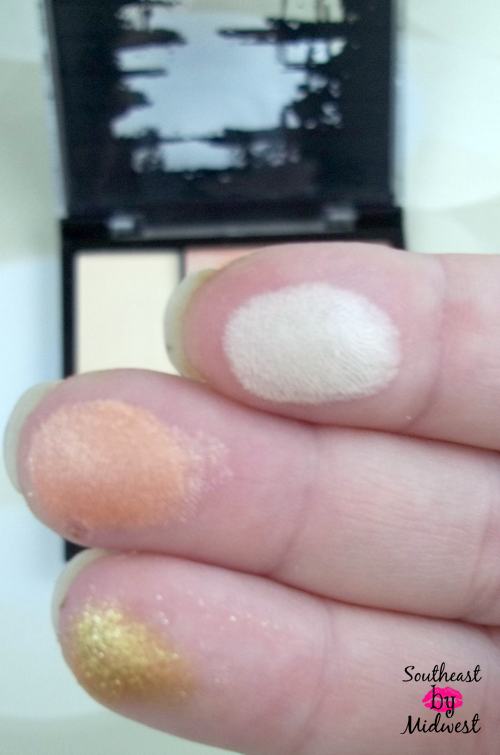 The pigmentation for both of these is just as great as the other three. 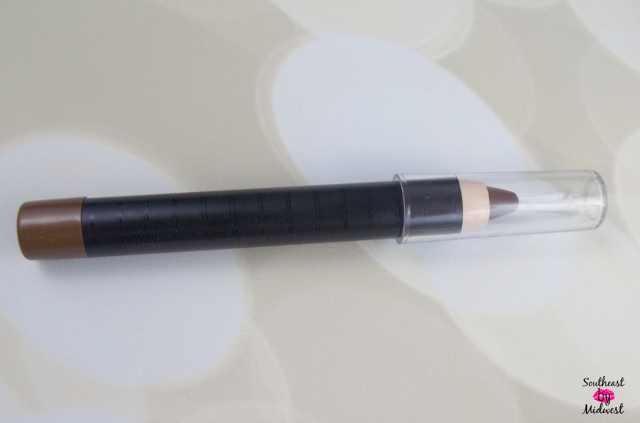 The eye crayon that comes in the Take Me Home set is I Wish and is a chocolate brown in color. As you can see it has that same brick theme going as all the other packaging has had so far. I will say that one thing I was afraid of when I saw this was that the cap would be one of those ones where it’s super loose and practically falls off all the time. This was not the case at all, the cap is actually pretty snug on there. As you can see this is just a straight brown, which I actually really like. I like the fact that it doesn’t have any glitter or shimmer to it that way I can use it on the outer corner of my eye to smoke my eye look out a bit. I prefer to do this with an eyeliner if at all possible instead of an eye shadow because I have found that if you work quickly they are easier to blend. I do think that next time I will probably set the eye crayon with either C’mon C’mon or Little Things. You can’t really tell but the packaging for the Little Black Dress mascara keeps with the brick wall theme that the other packaging has had. I do feel that with the mascara that they might should have included a little sticker on the bottom of the package that told you what the name was because it was hard to read the black text on the black packaging. Otherwise thought this is very sleek and sophisticated looking. 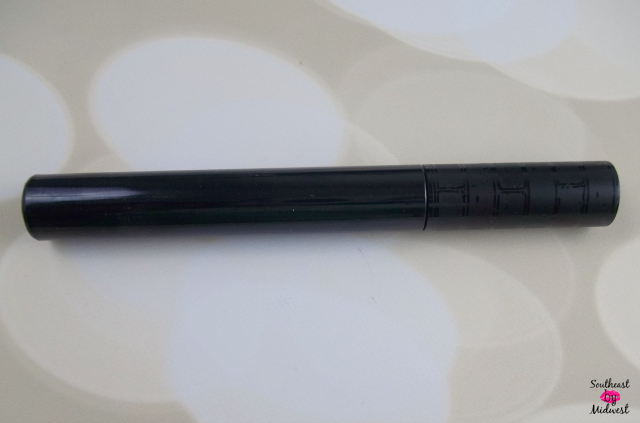 I do like the wand for the Little Black Dress mascara it’s not to small but it’s not ginormous either. 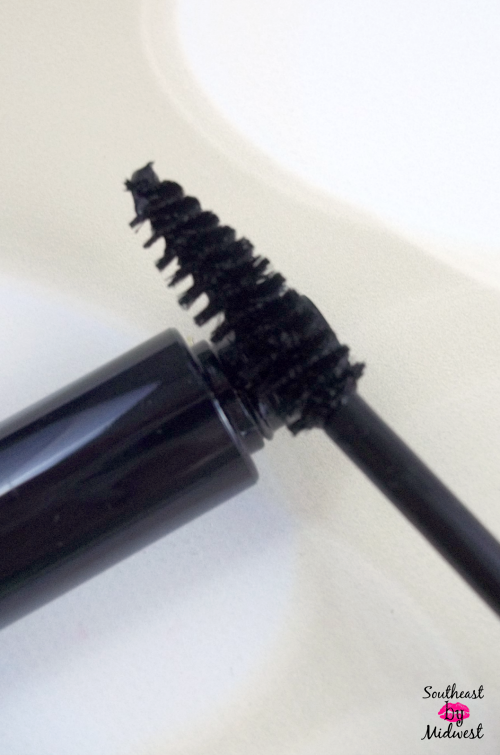 I found that the wand worked very well coating all my lashes and giving me decent length and volume. It wasn’t the best formula I’ve ever tried but that wand was pretty excellent. 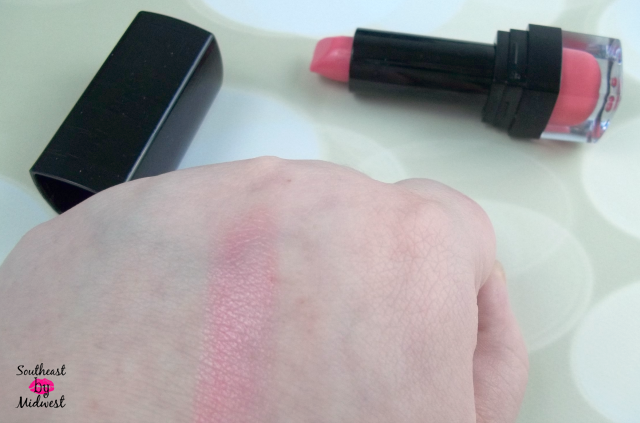 I really like it when lipsticks have that little bit of product at the bottom. I think that having that there, it gives the product a bit of sophistication. I also think that it helps the buyer to see the color without having to open the product, which by the way I find highly unsanitary. This is what the shade of Last First Kiss looks like. Forgive the damage to the lipstick that you see, I do not think that it was the manufacturers that did that I do believe it was our FedEx driver chunking it at our door! Other than that minor hiccup the lipstick looks and works beautifully. 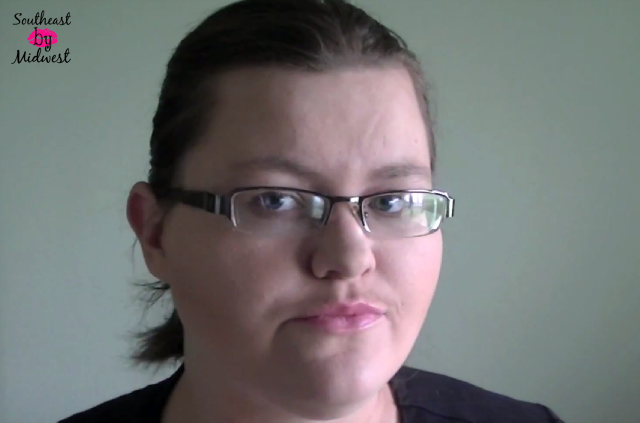 As you can see it is a bit of a sheerer lipstick, however, it feels super moisturizing on the lips. It’s not drying or sticky at all which I really like. I also like the fact that I was able to layer this up a bit without it pulling the other layers or making it tacky. I do think that on most occasions though I will stick with just the one coat because it does look absolutely stunning on the lips. 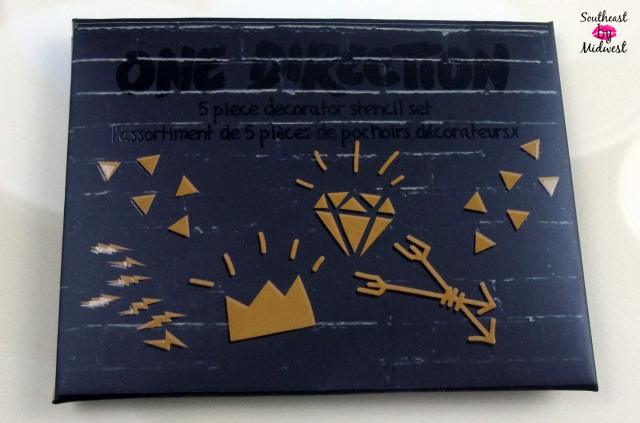 I think the packaging for Kiss You lip gloss is the best of the enter set. The orange shade is just beautifully showcased with this packaging. The shade of the lip gloss just really makes the wording on the tube just pop all the more. 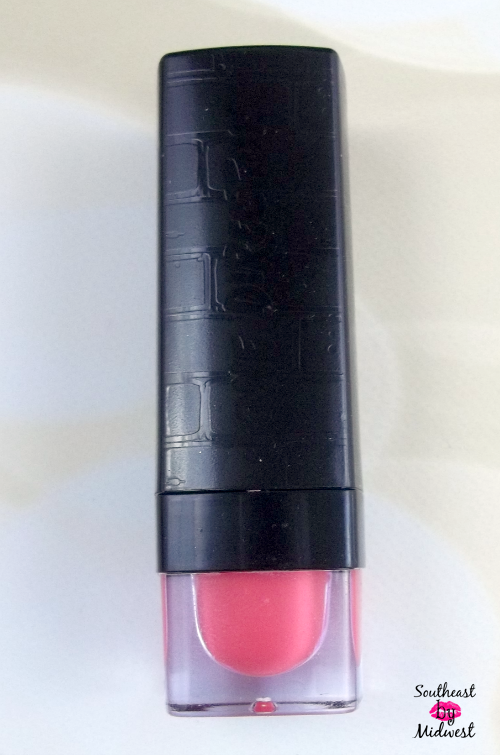 PLUS just look at the size of that lip gloss, I love that it’s not a small tube in the set. The wand is just awesome. I don’t normally like the flat on both sides type of lip gloss wand because I find that they usually don’t pick up enough product. However, that is not the case with this wand! 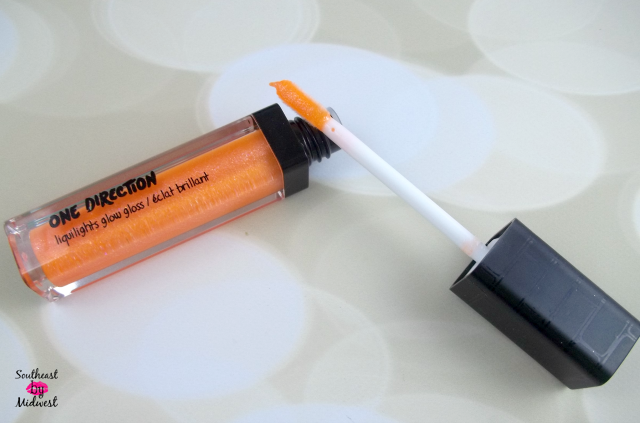 It not only picks up enough product but it glides effortlessly across the lip. As you can see it does have a bit of shimmer to it. I find that it’s absolutely stunning in color, I did find it a bit grainy on the lips thought. My only regret with this lip gloss is that I did not have a black light handy to use on it to see what the neon yellow looked like! I’m loving the packaging for the nail polish! It totally reminds me of butterLondon’s nail polish bottles. Live While We’re Young is more of a glitter top coat polish and I can’t wait to pop some white polish on my nails and give this a try! I think it’s going to turn out absolutely stunning! If you missed the Makeup by One Direction Makeup Tutorial at the top you can view it by clicking here. Also make sure to check out the Makeup by One Direction Facebook Page by clicking here. If you liked this tutorial be sure to check out my others by clicking here. 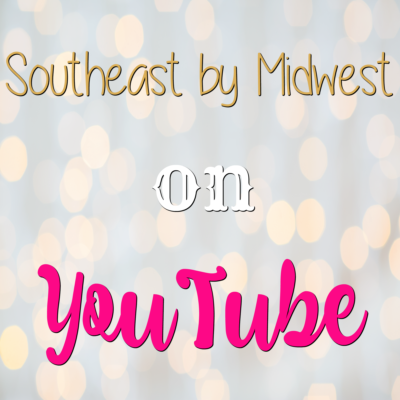 Follow Cassie @ Southeast by Midwest’s board BEAUTY – Makeup Looks on Pinterest. LOL, I thought this makeup was for kids 🙂 There are some cute things in the collection. You’re right about the pigment being nice and strong. There are some pretty colors in this set! I love the packaging and the names of everything. The colors of all of the products even look like what I’d normally use (I did not have high hopes when I saw the initial talks about One Direction makeup!) Thanks for reviewing it! There are some pretty colors in there.My oldest daughter would love this if she saw it but I do not want her to be wanting to wear make up so I will not show her lol. Ohhh I like that lip color! Can’t believe One Direction has a make up line! The pigments are strong. There are some nice colors in this collection though! I’d love to own ALL of that makeup! The colors are so pretty, vibrant,and perfect for summer. This is going to fly off of the shelves! I want one to give my niece as a gift! What a fun set! I agree about lipstick. I prefer ones where it’s sealed instead of wondering if someone tried the one I bought! I received a makeup kit to review too. Mine came with really bubble gum pink lipstick and lip gloss, which I could never wear, but my daughter adores it. The tin really has some nice makeup in it, mainly for the younger crowds though, because I can’t wear all those bright colors anymore! Great review! I love those colors. Do you know if it’s hypoallergenic? I have a lot of skin sensitivities. Thanks! Looks like some pretty cool products. I bet this makeup is going to be a best seller. This looks so cool! My nieces LOVE One Direction they would totally freak! I know what I’m getting them for Christmas!! What a fun makeup kit. It has so many great colors – it could actually make a LOT of different looks! Honestly, when I first saw this, I thought it was just a marketing thing for young girls, but this makeup actually looks pretty good. Just goes to show you, don’t make hasty assumptions. You look fabulous with the one direction makeup on. I will have to check this out. Surprisingly, this make-up by One Direction actually looks great! I’m loving the pigmentation of the eye shadow colors! Thank you for the review! I was not sure how to feel about this makeup line- since boys “created” it! I really love that lip colour! The eyshadows also seem great with a lot of pigmentation. I love how strong the color comes through! 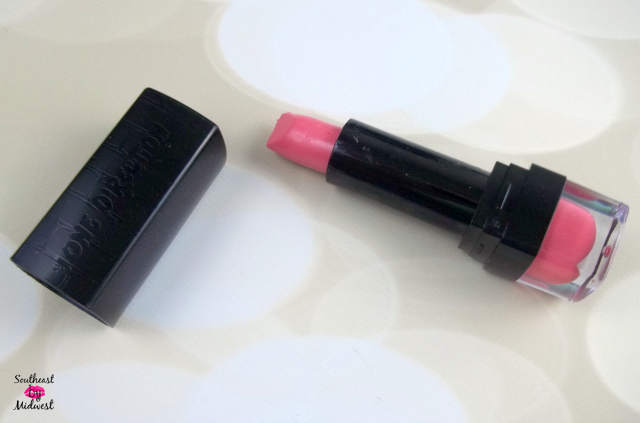 Too often you see makeup in its packaging, only to be let down when you actually try it on. I’m picky about palettes but this collection looks really flattering! 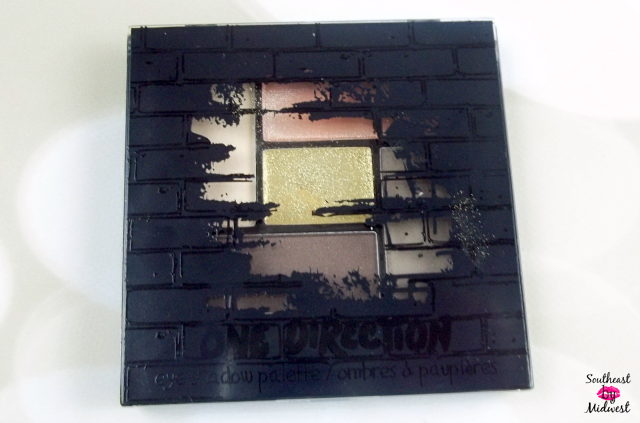 I didn’t know One Direction made makeup. It actually looks like some pretty stuff. We got this same set! Tween Girl and I both love it and the colors are awesome! Great video tutorial! 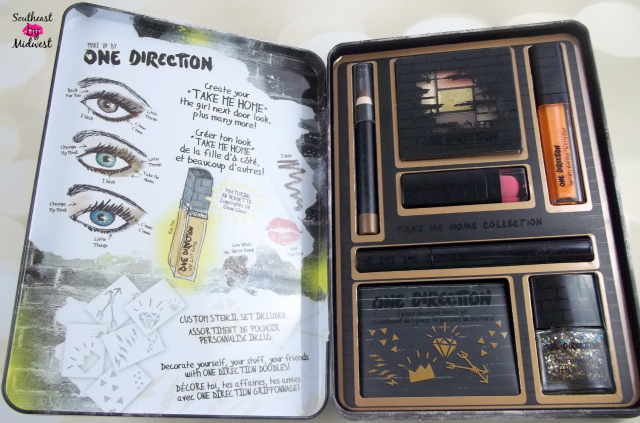 I had no idea One Direction had a makeup line! Those are some bright colors. That orange lip gloss is sure interesting. They have some great options. I love the pink lip gloss. 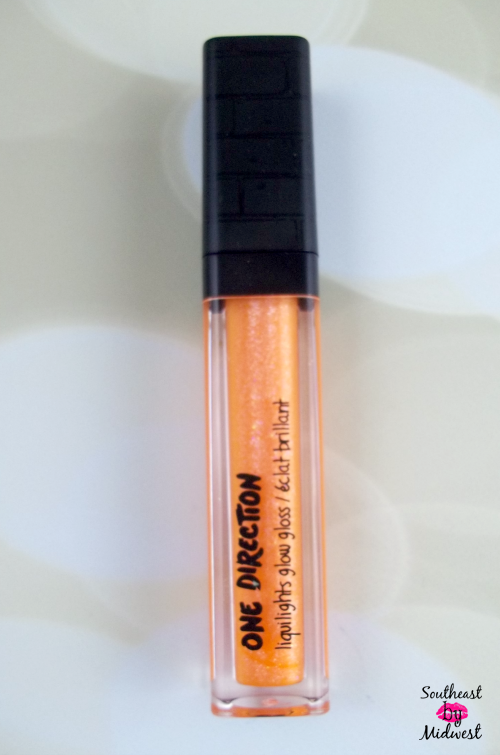 I’ve been hearing lots of good things about the new One Direction makeup line! I bet my daughter would love to try this out! Oh, I am going to share this with some teens that I know. They love One Direction and would love their make up. I like this line of makeup. I’m sure it will be a big hit. Great tutorial. I love the orange lip gloss color. Looks like an awesome product! Great tutorial too. I’m sure teen girls everywhere are squealing over this collection. So much stuff with it! Great video! The colors are pretty interesting. Who’d a thought they’d have a make-up line. Wow, the set has a TON of stuff in it! Looks like some great colors as well. Great post! I agree with you, all of the products are great but the gloss is the star of the set! Wouldn’t think One Direction would be an expert in make up but it looks nice on you! That glitter shadow is calling my name! Beautiful! This is a great set! Pretty colors, not too bold and not too soft. I’m not much of a make up wearer, but these aren’t crazy colors, so it might be okay. My girls would love it though! Good review. It was good to see the whole package. I love the set you got! For some reason I thought you got the blue set like I did, oops! That shadow palette is just gorgeous!! Also like the new blog layout and header! I’m loving the packaging of it all! 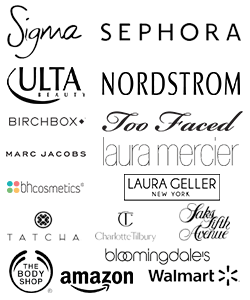 I’d love to try these products! Honestly not a fan of OD – but I do quite enjoy the eyeshadow palette! There’s some great colors in this kit! I may actually have to buy one! Nope, that orange is craaaaaazy! The makeup looks so fun!! I am loving that lipstick and lipgloss! 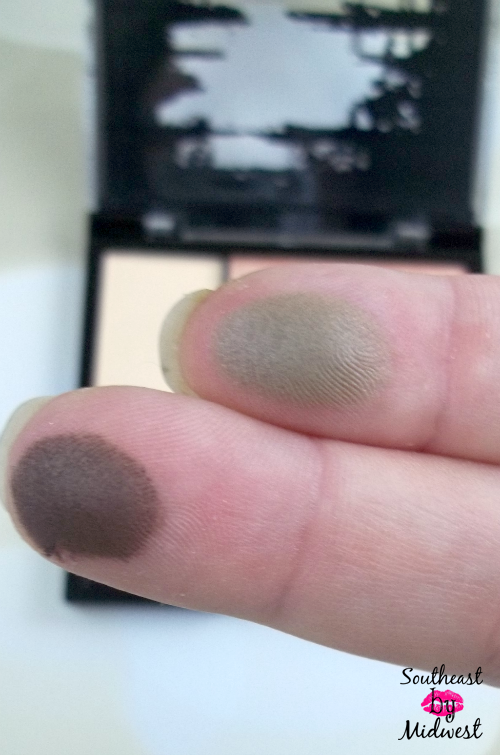 Without malice nor wish to offend or wound: bronzer should NOT be used as a product to contour features. Not even matte bronzer. Ever. Color theory: shadows — anywhere, but especially on the face — are not naturally orange, bronze, or shimmery. Shadows and contours have shades of greyish-brown (a bit of red); these recede and give depth. Not orange or bronze streaks on one’s jawline, cheeks, blobbed on the temples, nor down the sides of the nose. I’ve been a makeup artist for 18 years, and am merely sharing experienced wisdom. Best products to used for sculpting: Senna Cosmetics Sculpting Kit, Smashbox’s Contouring Palette, and Makeup Forever. None of which are bronzers. For one, makeup has 0 rules. As a makeup artist I would think that would be something that you would live by. For two, a matte bronzer can absolutely be used to contour. Try it, you just might learn something.